Thanks for all the messages on this feast of St Ignatius….. I have fond memories of celebrating this feast in Tanzania in recent years with our pupils, and in India with the Dalits, and in Manchester with some of the students. This year seems special, here at St. Beunos, in North Wales, directing the 30 days – in the silence of the Exercises, at the beginning of the Second Week. Now our retreatants are praying for a growing interior knowledge of Christ. Having meditated on the Call of the King they are now contemplating, step by step, the life of Jesus. After the intensity of the First Week it is a rich and vivid journey they are making, using imaginative contemplation. 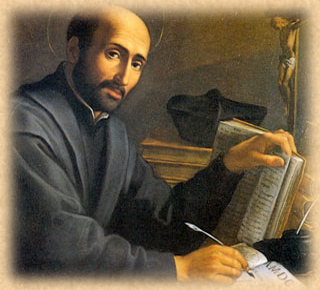 If we are to remember Ignatius for anything – it is not necessarily for the Jesuits, for our works, for the apostolates – Ignatius knew that we are founded to serve the church, to help souls. Famously Ignatius said if we were to be disbanded it would take 15 mins in the chapel for him to reconcile himself to that. The heart of St Ignatius is found most clearly in making the Exercises. That is a legacy of his that we can never lose. This uniquely transformative tool that has changed so many lives. And in the privilege of giving the exercises, I feel very close to him. One of the things we are encouraged to do is review our own notes of the Exercises we made in Tertianship. I was in Manila – three years ago – and during the second week I read a biography of St Ignatius by the Basque Historian José Tellechea Idígoras. It is the best biography I have read. I have been thinking a lot over the past few days about how Ignatius would ‘give’ the Exercises. There were no retreat houses in his day, no en-suite facilities! He would invite someone he had got know, for whom he thought it would be profitable. They would often stay in a spare room in his house and he would meet them after dinner to listen, to help and then set them points for the next day. Maybe we need to renew that practice ourselves….. and then there is beautiful description Idigoras leaves us with of Ignatius…. you can imagine him towards the end of his life…. perhaps leaving the house after having met his exercitant…. He wore a simple austere cassock and fought off the cold with a large cloak. When he left the house he wore a voluminous cape and a broad brimmed hat with attached chords that he tied to his chin. It was impressive to see him walking in the street. He was always going, because of some business, to some specific place or to see some particular person. At this period in his life his fair hair had disappeared, he was bald and wore a short beard from which loomed an aquiline nose and high cheekbones. His complexion had become darker, weather-beaten, perhaps even yellowish because of his liver ailment? His countenance, serious and peaceful, was the image of circumspection and a life lived interiorly. Some found it particularly luminous and expressive. His eyes which at one time had been sparkling and bright were now blurred by work, old age and copious tears. They had lost their gaiety but not their penetrating force. He seldom looked at people straight on. When he did, however, people said he took in the person from head to toe. His gaze seemed to have the power of seeing straight through a person right into his heart. Thank you for this. I love that extract from the book. I’m interested, however, that you read a book while making the Exercises. My experience in making and dirtying the Exercises is that this is discouraged.